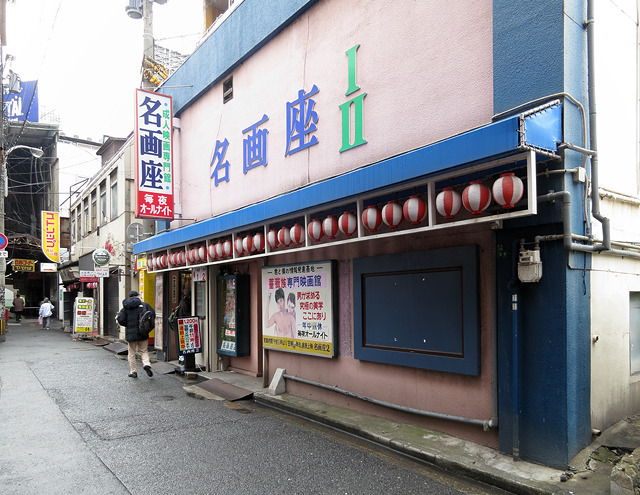 Just behind the Kokura station, there is a Japanese old style entertainment area. When you have a little time like 10 minutes between your plan in your travel or business trip, I would recommend you to go some place where is not major popular street, such as just behind a station. I am sure that you would accidentally find an interesting place or spot there. 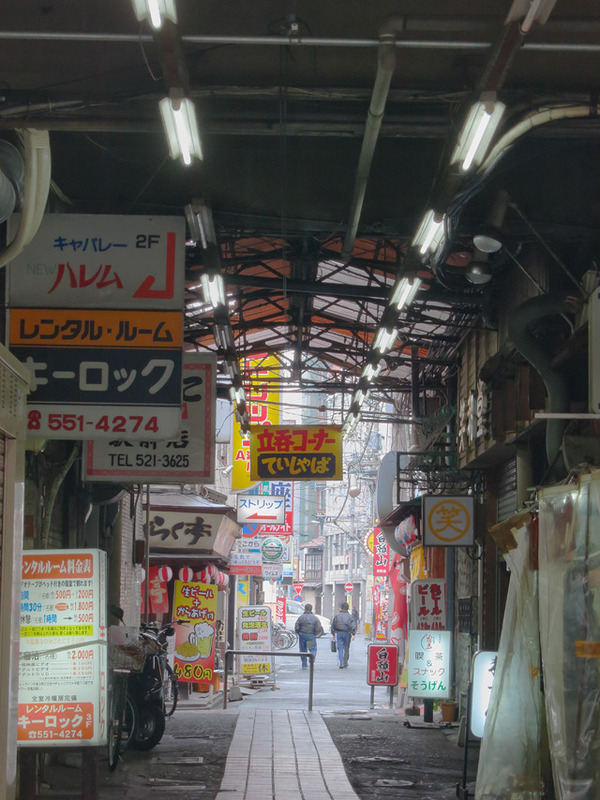 When the writer of this article one day went to Kokura city in northern Kyushu to take some photographs, he had a little time before his next plan. 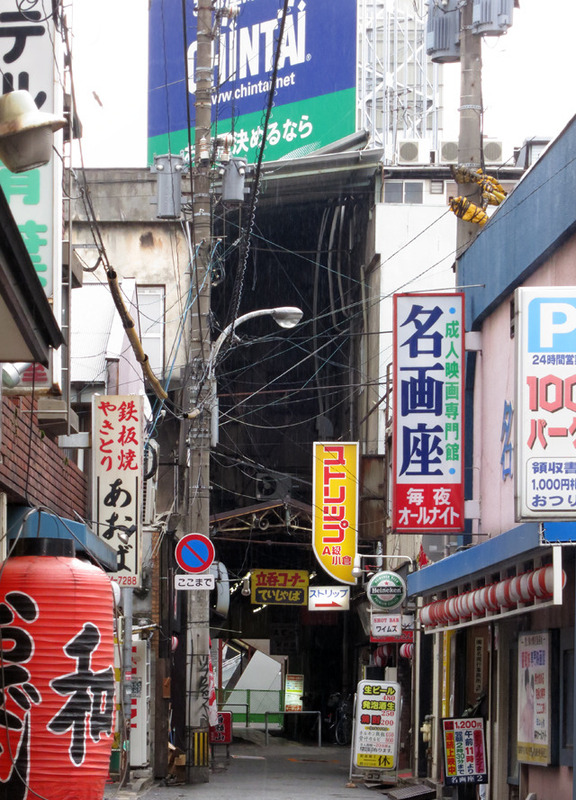 So he decided to take a walk around the Kokura station, to the direction of minor streets where people don’t often go. Wow, an old strip-show theater, says “Class A Strip-show”. 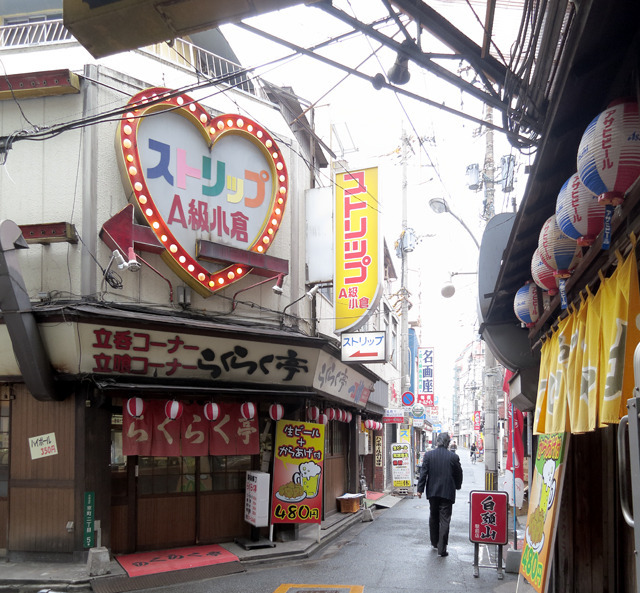 Under the big sign of Strip-show theater, there is “Tachinomiya”, a standing bar where you can drink beer and bite some chickens and light foods. And across from the bar, there is a same kind of bar they serve the same kind of drink and foods. Wow, it’s an old theater for adult only. “薔薇族” means like gay. I didn’t know about this…. The ad says “For 薔薇族 only”. “The ultimate aesthetic the men desire is here”. OK, this is an old style gay movie theater. Umm…, it looks a little bit mysterious. The other side by the way, there was a downtown with an old nostalgic atmosphere. There are many old bars and restaurants. At night, it must be full of local people enjoy drinking and talking. Because he visited there on daytime, there were fewer people and the town was like sleeping. But you can imagine that the town would be full of people who enjoy drinking and talking each other at night. Imagining that, he went through the street and back to the front of the station. 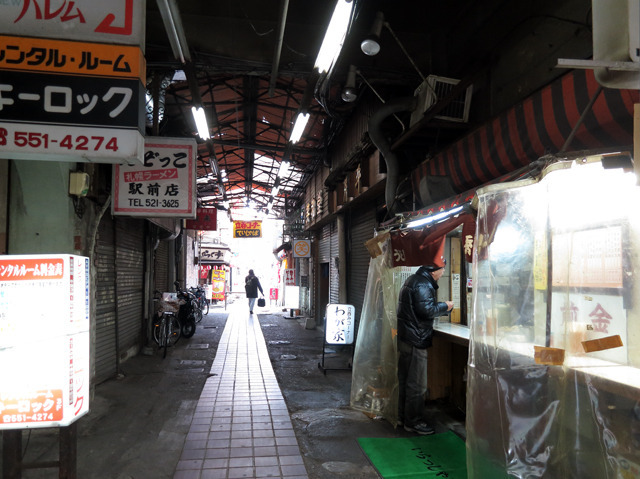 Just for 10 minutes, he took a nostalgic trip back to Showa era in Japan, between 1960~1980s, just behind the Kokura station. I think it’s really attractive to use your 10 minutes to go around like this place and you can find an other face of a big station.